Lockheed Martin Space Systems Company at Michoud Operations won one of four contracts awarded by the joint Defense Advanced Research Projects Agency (DARPA)/Air Force Small Launch Vehicle (SLV) Falcon program in September 2004. DARPA and the Air Force awarded Lockheed Martin an $11.7 million contract last year to conduct a preliminary design and development effort to refine its SLV design and conduct risk-reduction testing. Lockheed Martin is one of four teams selected for this phase. DARPA and the Air Force supported four companies investigating a range of Small Launch Vehicle designs. 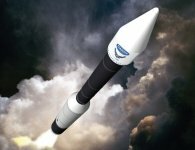 The Falcon program is a 36-month long Phase II effort to develop and demonstrate an affordable and responsive space lift launcher capable of placing a small satellite, weighing 1,000 pounds, into a circular orbit of 100 nautical miles. The goal of the Falcon SLV Program is to develop and demonstrate an affordable and responsive space lift capability that can quickly launch a small satellite into Low Earth Orbit. The Lockheed Martin hybrid rocket differs from liquid fueled and solid propellant fueled rockets, because it combines technologies from both types of launchers. Typically a hybrid rocket uses a rubberized fuel and liquid oxygen to generate thrust. Hybrid motors combine the best of solid and liquid propulsion systems, typically using an inert fuel and liquid oxygen to generate thrust. Hybrid propulsion offers significant gains in safety, throttle-ability, cost, and affect on the environment. Lockheed Martin built the hybrid motor in the same building where it constructs the Space Shuttle External Tank at the NASA Michoud Assembly Facility in New Orleans. Lockheed Martin has developed hybrid propulsion systems since 1989 and performed over 600 motor firings, including a successful launching of a 60,000-pound-thrust sounding rocket from NASA Wallops Island, Va. in 2003. A large hybrid rocket motor was successfully test-fired on its test stand 21 January 2005. The test took place on the Air Force Research Laboratory's Test Stand 2-A on the ridge overlooking Edwards' dry lake bed and surrounding Mojave Desert. The operational test stand had been readied for its first customer, Lockheed Martin Space Systems Company at Michoud Operations, located near New Orleans, La. The activation of the test stand followed its rededication on Jan. 14, 2004, refurbishing the Apollo era test stand into one of the nation's most modern large rocket test stands. On 10 June 2005, Lockheed Martin successfully test-fired a hybrid motor at AFRL facilities as part of the Falcon Small Launch Vehicle (SLV) Program. This was the second SLV hybrid motor firing conducted this year at the Propulsion Directorate's Test Stand 2-A at Edwards AFB, California. The hybrid motor that was tested is a full-scale test version of the upper stage motor on Lockheed Martin's SLV and measures 11 feet in length and 5 feet in diameter. The motor fired for the planned duration of 120 seconds, twice the length of time of the first firing that occurred 21 January 2005. It is believed that the 120-second test was the longest burn of a hybrid motor of this scale. Preliminary data indicate that the test objectives were met, and this firing serves as a significant accomplishment toward reducing the program's technical risk.